There has been a lot of heated debate, no pun intended, in relation to Global Warming or as Mr. Bush likes to call it Climate Change. My Dad sent me the following photo however which I think dispels any doubt. 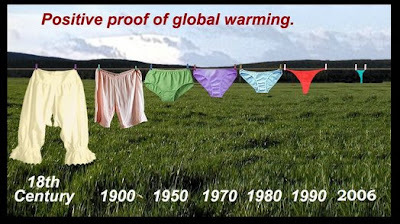 Speaking of warming! Sharon managed to put a temperature gauge on the side bar of the blog, thanks to Samurai Knitter, so people can laugh at how cold it is here at the moment. Remember though when you are reading this it will probably be your day time and therefore our nighttime temperature! We have 5 entrants into the 100th post prize thus far, I like those odds. Sharon's mother sent her an email asking to enter the competition but then reckoned she has a good chance of getting some NZ yarn anyway - so, no pressure there then! Remember if you're not in you can't win, the comp closes on Sunday 15th.